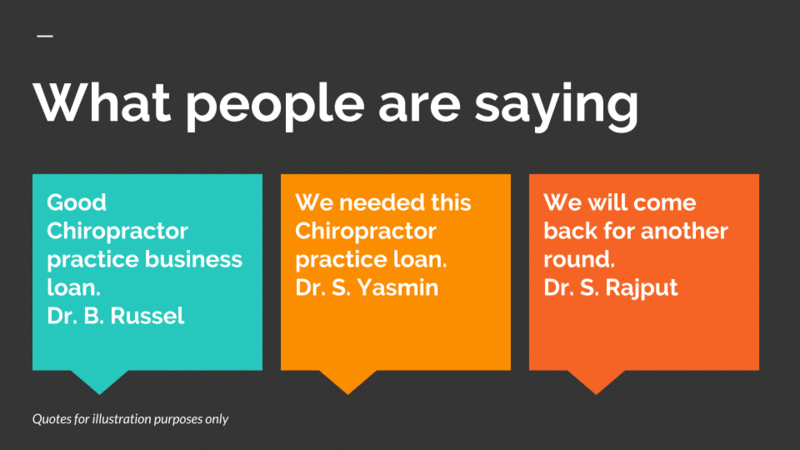 Alternative programs for a chiropractor practice loan almost all practices can qualify for. Programs include loans based on either your practice’s gross sales, total deposits, practice assets, or equity in real estate. Credit scores below 500 and as low as 400 are considered. Approvals as low as $2,600 and up to $1,000,000 or more with no restrictions on the use of funds. Use the funding like an loc line of credit. Your practice can borrow, repay and borrow again in many cases when there is a need. Limited paperwork. Just a one page application and most recent (3) months bank statements. Same day closings available. Use the funds to increase revenues of the practice such as hiring more employees, advertising, expansion, increasing office space, and any other reason. No upfront processing fees or upfront application fees. 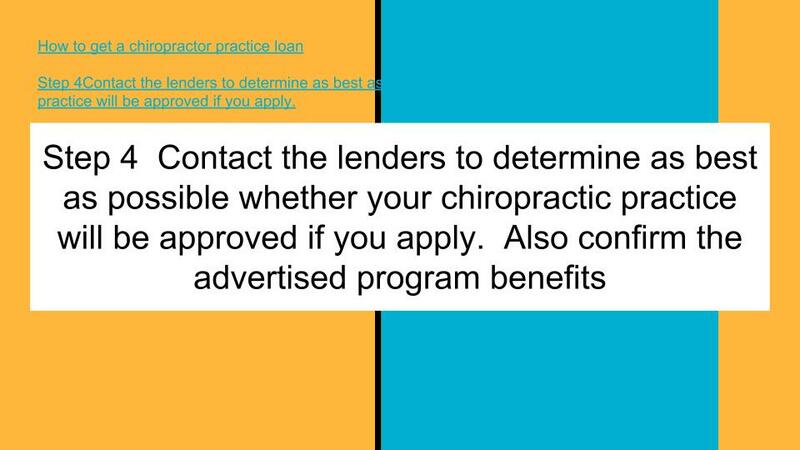 Step 1 Search for lenders that offer chiropractor practice loans. Review program options and consider how the program can help your practice. Step 2 Tip Practices that have operated for more than one year can qualify for better terms. 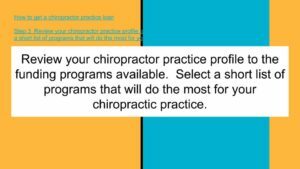 Step 3 Review your chiropractor practice profile to the funding programs available. 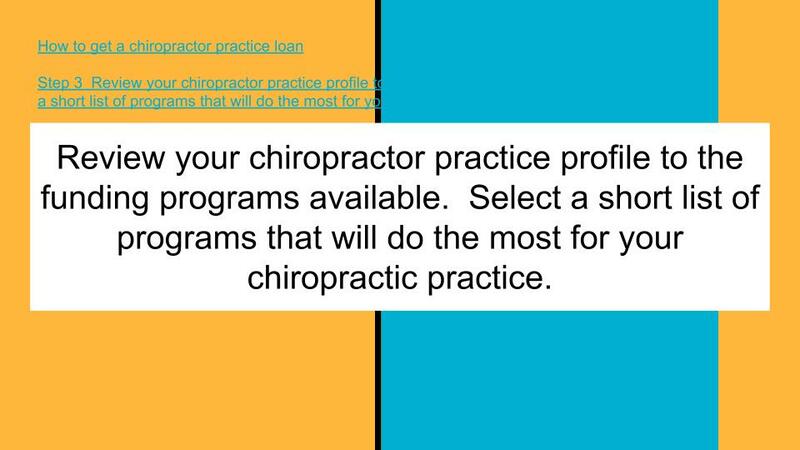 Select a short list of programs that will do the most for your chiropractic practice. 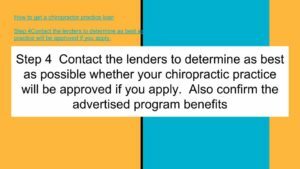 Step 4 Contact the lenders to determine as best as possible whether your chiropractic practice will be approved if you apply. Also confirm the advertised program benefits. 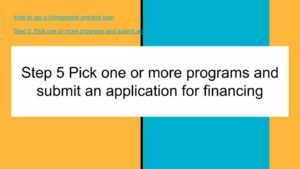 Step 5 Pick one or more programs and submit an application for financing. Provide any documentation that strengthens your request even if it is not required. This can include financial statements, tax returns, or other information. Step 6 When you receive an offer, review all the terms and conditions. If you are ready to close, provide all documentation required for closing. Check if there is a right of recision period. Question: What if we need more than we are approved for? Answer: A second additional funding can be considered. If the practice has the cash flow for more funding, then more funding can be approved. A practice that qualifies for $50,000 can close the 1st transaction, then get a 2nd position for $25,000 for a total of $75,000. *TIP: A second part or second transaction is often called a “2nd position”. Question: Our chiropractic practice does not have assets and revenues are only about $225,000 per year. Can we get an offer? Answer: A practice with little assets and sales of $225,000 per year may still qualify for up to $25,000 based on the cash flow and customer profile. What ownership percentage is required for a chiropractor practice business loan? a minimum 50% ownership is required. When there are 2 owners at 50% ownership, the stronger credit of the two 50% owners should be listed 1st. the weaker credit should be the co-applicant. If one of the owners has very weak credit then only the strong credit applicant should be on the application. Financials are not required for transactions under $250,000. No tax returns, personal financial statements, or interim statements are requested in almost all requests under $150,000. For requests over $250,000, the practice may want to provide financials to strengthen the chance for approval and the approval amount. Learn how to get funding for your practice with any problems. 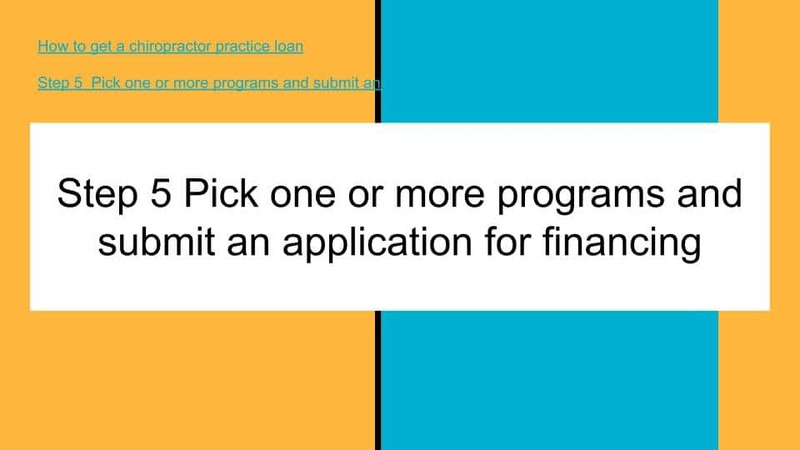 Apply today and get funding the same day or the next day.